Paddle Boarding Part 1: What’s Your Default? We’re in Grand Lake, CO, aka paradise, this week spending time with family and friends before the big move. We rented stand up paddle boards this morning and all gave it shot. Of course, like everything, this turned into an alignment education opportunity. When you get on an unstable surface, what is your default position? This is my sister, Tarah, who is an English horseback rider and trainer, which means she spends a lot of time on a horse. She’s been riding horses for almost 20 years. She is really strong, stable and comfortable in her riding posture. This is how she looked on a paddle board. Which is the same posture she holds on a horse. An upright torso, bent knees, wide knees, feet turned out. Straight line from the shoulder, through the hip, to the heel. Fascinating, right? When we are on an unstable surface, we tend to go to our default position, the position in which we spend most of our time and are therefore most comfortable. She was able to get into the position that she trains in and use the same muscles, so the activity felt fairly easy. This comes in handy when you’re trying not to fall into a recently thawed lake. For other, non hypothermia inducing situations, we want to work towards being that strong and balanced in every position. When we use all our muscles and joints in a variety of positions, it keeps blood flowing to all the tissues (=oxygen/nutrients in & waste out) and keeps them healthy. Using all our muscles (rather than just the ones we always use) increases our metabolism and reduces our risk for overuse injuries. To figure out what your default position is, just find an unstable surface to stand on and watch yourself in a mirror. 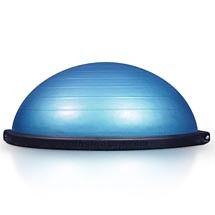 The BOSU is my favorite habit revealing tool! Next postPaddle Boarding Part 2: Take a Stand for Your Knees!